People in countries outside of Colombia call them tostones and I am not sure what else! They are nothing like what you buy in bags at the store in the “Goya” section. 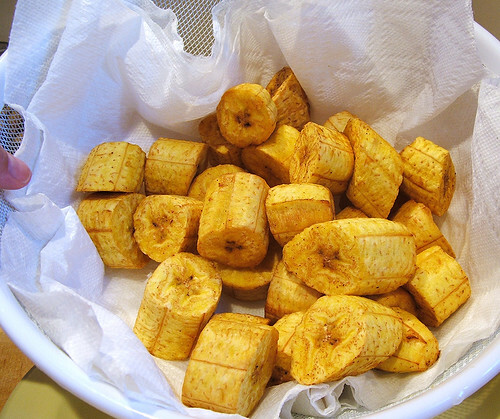 Those hard plantain chips are scary, I almost broke a tooth on one! Real homemade platanos are a bit crispy on the outside and moist on the inside and should be eaten hot out of the oil, well salted. I suggest also poking a few holes with a fork and slathering it with butter (yum). Heavy pan or board covered with foil or plastic and well-oiled. As many large platanos as you desire (these are green plantains that are starting to show a faint yellowing, but not much, along the ridges). 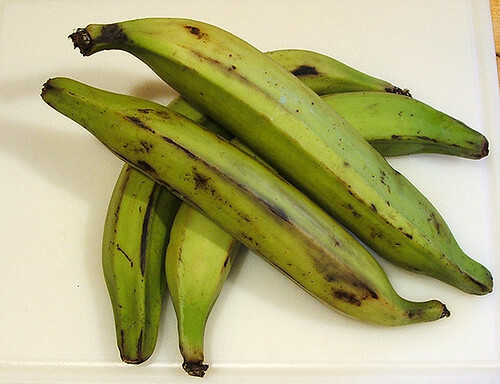 If in doubt, use large all-green platanos. Heat oil in the heavy pan. 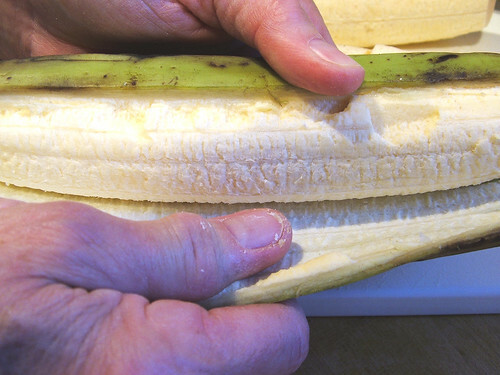 With a sharp knife, cut off the two ends of the platano. Then score down vertically along one of the ridges, start peeling aside by flicking the knife edge under the peel along the cut edge. 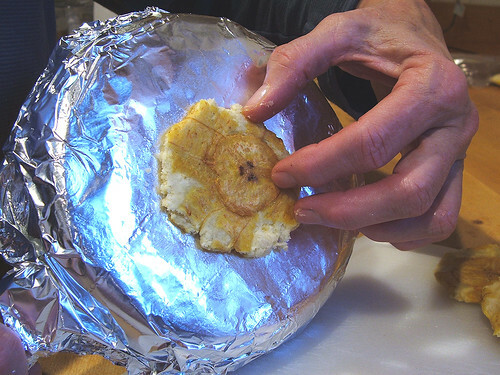 Note: This works really well if the platano has NOT been refrigerated. After you have peeled the platano, cut it into 2 inch pieces. Place the pieces in the medium/hot oil and continuously turn until they have turned a golden color. Remove the pieces from the oil to drain on a paper towel. Let these pieces “rest” for at least 15 minutes. Using a sturdy well oiled plate, smash the pieces flat. Return the flattened patacones to the hot oil for another 5 minutes until lightly browned, then remove to a paper towel. Serve immediately or they will get tough. 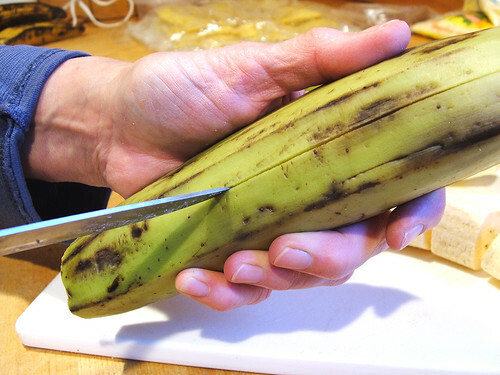 A sharp knife is run along the length of a green plantain. Green plantain is stripped of it’s skin. Be careful about not loosing the flesh of the plantain as you wrestle with it. 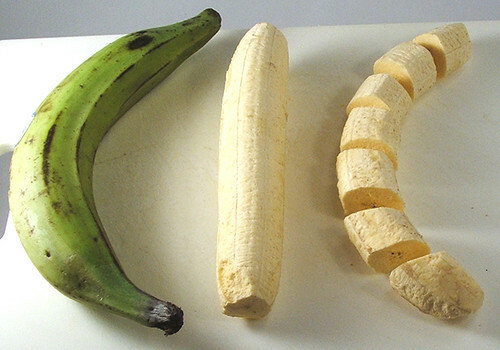 This photo summarizes the process from unpeeled plantain to the chunks you should cut. Fry these little beauties to a golden brown. Notice that I use my dutch oven with a heavy bottom. You do NOT want to use a cheap pot for frying anything. You need to distribute the heat evenly. Cut up portions of platain are deep fried to a golden color. These need to rest something like 15 minutes before crushing. 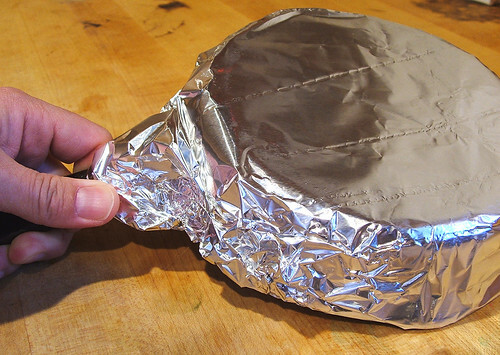 Cover a heavy pan (this one is cast iron) with foil. To be used to crush the fried plantains chunks. 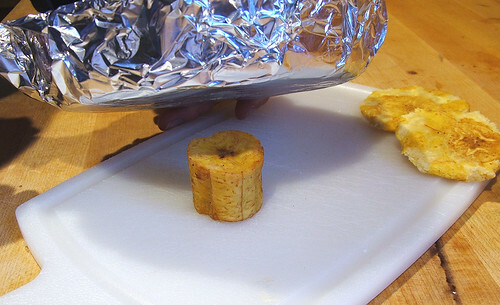 The fried plantain chunk is crushed with the foiled pan. Some crushed ones are seen to the right. The patacone has been crushed flat and is peeled gentle off the bottom of the pan. This will be fried after a short rest. Fry them to a golden color, enjoy! This photo shows the progression from chunk to crushed and fried. Vanessa – thanks for stopping by! Yeah, that story is wonderful, makes the American Dream seem just a bit more real. Thanks for your kind words re: my blog! I have looked at both the cmpanada pictures and those of the the patacones and my mouth is watering. I am a Colombian-American, now living in Pennsylvania and missing all the extraordinary foods of my wonderful country. I will be interested in getting your book when it is published!. Elena: thank you for stopping by! I am glad you love Colombian food as much as I do! I am still plugging away at the first book. Will definitely let everyone know when its ready to go! This “how-2 guide” is great! 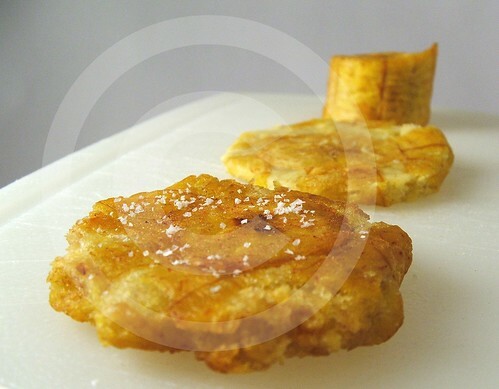 I wrote a post on my own blog trying to explain the process of making tostones but I found that your photos and explanations are so great that I added a link to your site instead of trying to explain everything on my own without the photos. Thanks a lot! P.S. I really like your site! nicole: I am so glad you liked it! Will check out your blog for that post. maggie: Yeah, I have seen those directions in recipes for tostones of the puerto rican variety. I never saw my mom or my grandma or other relatives use this method. I wonder if it has an impact on the final texture. I also would wonder about that water causing more oil splatter (you know, the little explosions that happen when you put water in hot oil).. Next time I make patacones, I might experiment with it. Every time i see my grandma make these she crushes the plantains raw before frying them and they still come out the same…does she have a secret or can i try the same thing? Hmm .. I have never seen them made that way. You might want to ask her why she does it that way, might be a short cut she prefers. do you know how to make empanada chips there made out of the same substance as la empanada. i tried to fry them in the shape of a triangle put it kind of exploted in the oil, so please if you have any ideas please email me. Fernando: I have never heard of this. I cant vouch for any of this! Hey — thanks for the recipe. We adopted our Colombian-born son from the country 7 years ago and celebrate his adoption each year by making Colombian-based food. I forgot how to make the fried plantains that we so enjoyed down there. Thanks for the nice description & pictures. Looking forward to making them this year! Thanks! Hi – Our girlscout troop is working on Columbia for our annual “Thinking Day” celebration and we need to make a traditional food. The troop wanted to make empanandas but we need something that can be made ahead and isn’t so expensive or time consuming with multiple steps. Do you think we could make the platanos several hours ahead of time and if we do should we try to keep them warm or just let them cool off? We need to make a taste for 150 girls – if you have any other ideas, we also considered arepas, please let me know. The girls are around 10 years of age and would have adult supervision in the kitchen. BTW I love your step-by-step for both empanandas and platanos! Kathy: I hope that your platanos turned out well! Lisa: re: your Colombian feast – I suggest the easiest thing might be to make arepas (inexpensive and simple directions). You can make them ahead of time and then warm up in foil at time of eating (cold ones are not that great) – adding some butter and salt will also make them super delicious! I make them the size of a 10 year old’s palm (not ginormous like some people) If you can use a grill with adult help they might turn out more delicious – can also make then on the broiling rack in the oven or in a heavy cast iron pan on the stove – it takes some practice and definitely will require adults watching the cooking parts. Hi there! I stumbled upon your site with the thought of empanadas in my mind. I used to live in Colombia and have not forgotten how amazing their food is. I was wondering if you had a recipe for ajiaco or arequipe! 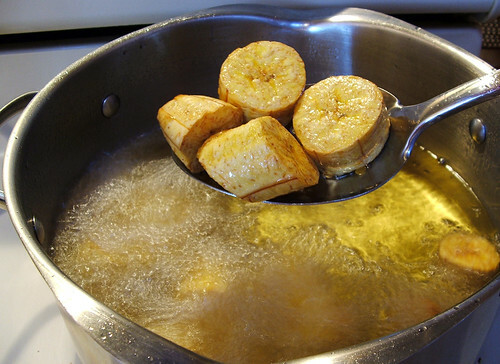 Well, I am a 12 year old who is Dominican and this website was fantastic.I learned for the first time how to have the green platanos perfect and cut well.My grandmother screams at me and thats how i cant get it right.So by yourinstructions, I have done a wonderful job.All I had to do was not concentrate. I’ll be looking forward to looking for stuff more on your website.